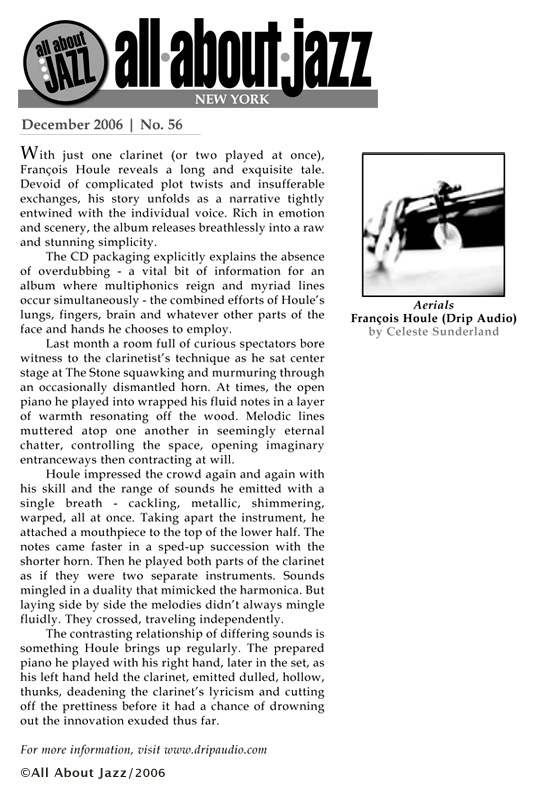 Clarinetist François Houle has established himself as one of Canadas finest musicians. His performances and recordings transcend the stylistic borders associated with his instrument in all of the diverse musical spheres he embraces: improvised, electro-acoustic, new music, classical and jazz. 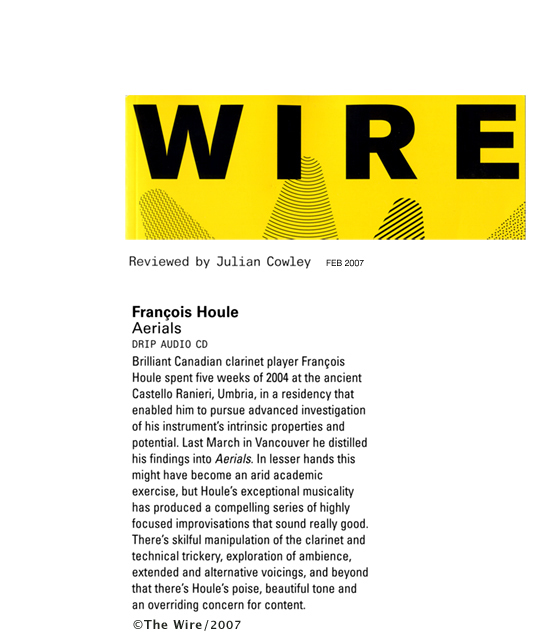 Aerials is a set of improvisations exploring the clarinet's uncharted territories. Developed during a five-week residency in Italy at the 15th century Castello Civitella Ranieri, the music is complex and seductive, taking the listener deep inside the instrument. 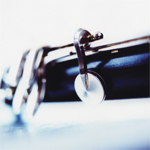 Technically, this recording taps into the clarinetist's inclination for the unexpected; from disembodied clarinets played simultaneously to flute-like melodies. Examining the way the instrument "reacts" to various acoustical spaces, such as inside a grand piano, this program is virtuosity coupled with stunning lyricism. 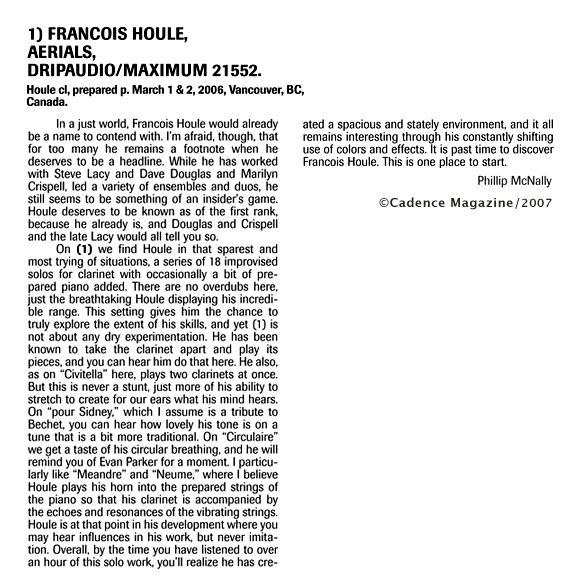 François Houle has been nominated for West Coast Music Awards, Juno Awards and was listed in Down Beat Magazine as "Talent Deserving Wider Recognition" in it's annual critics poll. He has released more than a dozen albums of his own music and has recorded and performed with other great artists such as Dave Douglas, Jerry Granelli, Joelle Leandre, Marilyn Crispell, Evan Parker, John Butcher, Michael Moore, Georg Graewe and Myra Melford. His CD Dice Thrown with French pianist Benoît Delbecq was awarded Best Jazz Album of 2002 by Frances Jazzman Magazine. Labels Houle has recorded for include Red Toucan (Montréal), Songlines (Vancouver), between-the-lines (Frankfurt), Hat Art (Zurich), empreintes DIGITALes (Montréal), Spool (Scarborough), and Nuscope (Dallas). Aerials is his first solo release on Drip Audio. "A master of extended techniques (chirps, multiphonics, circular breathing, etc.)"